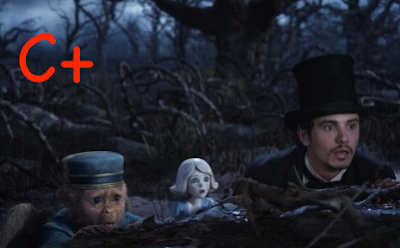 If you’ve ever wondered how Oz came to be in the land bearing his name before Dorothy or Toto arrived, then Sam Raimi’s Oz the Great and Powerful can handle your curiosity. While Frank Baum’s original novel The Wonderful Wizard of Oz (1900) is now listed in the public domain, the 1939 Victor Fleming film with beloved Judy Garland is still protected, which could explain why so much in the film is intentionally off from what we remember in the classic musical we grew up to adore. Although the movie’s title needs a comma after Oz, just saying it makes us feel like we need to admire it a bit more, but we won’t be admiring it too much—and not because of that missing comma. With less than a halfhearted musical and no other melodious moments to accentuate our journey, the whole thing is somehow less than magical...even with the magic. In memory-probing black and white in the city of Kansas, we meet our Oz, “Oscar ‘Oz’ Diggs” (played with incredibly wavering commitment by James Franco). The spin-doctor and small-time conman is performing at a local circus. Other than stacking away funds, his goals center around trying to get beautiful women in bed with him through charms and tricks. But his sleight of hand skills can do little against an angry strongman who chases him into escaping the scene in a hot air balloon. Whisked away in a tornado, he ends up in a land of beauty, a land far from home. Here in Oz, things gradually fade into color. 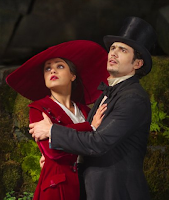 When he lands, he meets “Theodora” (Mila Kunis, clearly out of her depth in a character who goes from sweet and alluring to unreasonably vindictive in mere moments). Even the audience can’t get used to her. 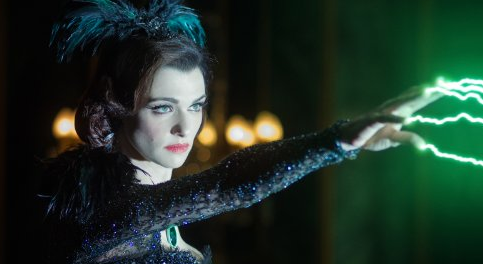 Her sister “Evanora” (Rachel Weisz) introduces herself as the personal assistant of the king to be. When Oz learns that the land has fallen into oppression by an evil witch and that a prophecy states that one called Oz would come to sit upon the throne, he immediately plays the role as the man of destiny—motivated by beautiful witches and literally tons of gold in the Emerald City. But first, he must kill the witch of the East. At least, that is what he is told by Theodora and Evanora. From there, we can predict that things will turn out to make this another movie where the bad guy with deeply hidden good finds it in himself to be more than he started out as. Once we meet “Glinda” (Michelle Williams, one of the best reasons to see this film), it isn’t too hard to see where things are going. With Oz freeing a stuck winged monkey (Zach Braff, voice, a character that does practically nothing for the movie) and later, repairing the broken legs of a China Doll Girl (Joey King, voice) after her town is demolished by evil flying baboons sent by the wicked witch, we get knocked back into that “where the hell is this film going?” mindset. But, thankfully, it doesn't hold us for long. When Oz discovers the truth that the witches are hiding from him, he must face the fact that he is outmatched as a fraud and unfit for the task of the long-awaited master wizard. This brings him to the challenge of finding a way to use his skill of trickery to keep the hearts of the city at rest and assume the thrown. With the reconstruction of Oz being a bit less than what was expected, the film’s efforts to keep from passing as an expensive-but-cheap new re-edition of the classic work are notable. With flopping humor but a fairly well-paced plot that is whimsical enough to keep it moving forward, the film will be more of interest to children today than adults who will see through the piecemeal performances that continually drag things down. But all is not lost. Oz the Great and Powerful does pleasantly occupy our minds for over two hours. Prequels have a way of appealing to nostalgia seekers, thereby arousing the interests of those who otherwise would be a lot less enthused with a project. Note: It won’t be obvious, but Williams who plays “Annie” and Glinda (the woman who at the start of the film comes to Oscar after the circus and tells him she has been proposed to by a man with the name Gale) is supposed to be the mother of Dorothy Gale. Things would have gone much different if Oscar had stayed behind to marry her. The light-but-suggestive references back to The Wizard of Oz give this one some much-needed help. And like the first film, this one might grow on audiences in times to come. Did I mention that Michelle Williams is one of the BEST reasons to see this film? !